Affluent investors sent mixed messages of economic confidence and investment caution as the November Spectrem Affluent Investor Confidence Index (SAICI®) gained 1 point from October to 6. 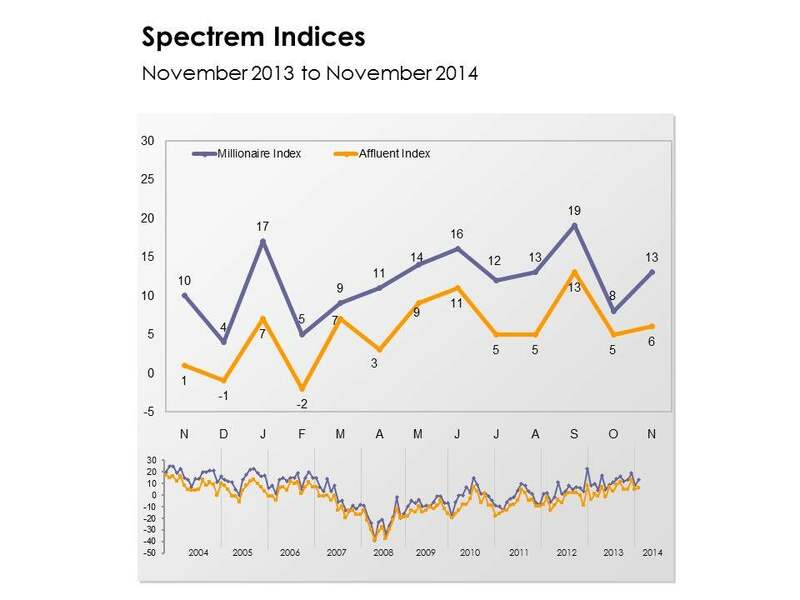 The Spectrem Millionaire Investor Confidence Index (SMICI®) gained 5 points to 13. The indices measure the investment confidence and outlook of households with more than $500,000 of investable assets and more than $1 million of investable assets, respectively. The November SAICI is up 5 points from the same period last year. The SMICI is up three points from November 2013. On the one hand, Affluent investors expressed a surge in confidence in financial factors that impact their daily lives, as measured by the Spectrem Affluent Household Outlook. The Outlook in November gained 12.1 points to reach its highest reading since April 2007. The Millionaire Household Outlook was particularly robust, gaining 13.13 points to 34.40. Millionaire confidence in the economy is at a more than three-year-high, the November survey revealed. But on the other, November is the third consecutive month in which there was an increase in affluent investors who indicated that in the coming month they would hold on the sidelines. This may be the lingering impact of the stock market volatility of September and October that no recent record closings can completely overcome. But it is not the stock market conditions that are most affecting the current economic outlook of affluent investors. When asked in November which news story was having the most impact on the investment mindset and economic outlook, the highest percentage cited the political environment. This is not surprising in a month in which the midterm elections brought a seismic shift in power in the Congress and rekindled partisan contention between Democrats and Republicans over such issues as immigration and health care.